My first book, "Storyteller: How to be an Audio Book Narrator", publishes today! Today's a really special day for me! Not only is it my birthday, it's also publication day for my very first book - "Storyteller: How to be an Audio Book Narrator". I co-wrote it with audio producer/director Ali Muirden, and it has advice and information from both sides of the microphone. I've been thinking about writing a book like this for quite awhile, but - off the back of visit to the States to be inducted into the Audible Narrator Hall of Fame earlier this year - the time seemed right and I spent the summer writing. People often ask me about how to become an audio book narrator, or what the job is actually like - I hope this book answers both of those questions. Janet Evanovich, #1 New York Times best-selling author says, "Lorelei King does an amazing job narrating my Stephanie Plum series – it’s no wonder they call her the queen of audio books! 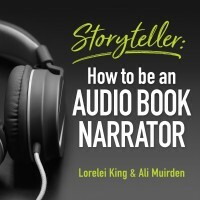 In ‘Storyteller', Lorelei openly shares her expertise and gives listeners an inside look into what it really takes to record an audio book. 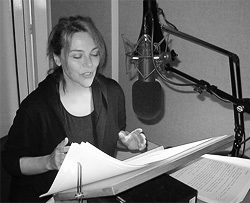 A great listen for anyone who is a budding narrator, or just a lover of audios." I loved writing and recording this book, and I hope you enjoy listening to it!